Special Order: Please note that this item is not currently in stock but is available for Pre-Order. Delivery from our European manufacturers is expected in late July/early August. For more information please give us a call at 800-600-0033 or e-mail us at info@morewinemaking.com." 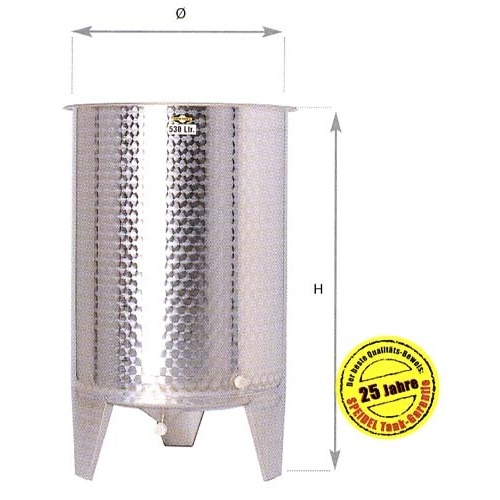 Note: The price listed below is for a standard base tank with no additional options. Please refer to the "You May Also Need" section at the bottom of this page to review the options that are available for this particular tank. Don't see what you're looking for? Many custom options are available. Feel free to contact us at info@morewinemaking.com with your needs for a custom quote. Rubber Lid Gaskets - New for 2009! That's right, starting in 2009 all Speidel Variable Volume Tanks will come standard with our upgraded White Rubber Lid Gaskets. Rubber gaskets are much thicker than the traditional clear vinyl gaskets, which along with their extruded manufacturing process provide a much better seal with the tank's wall. That means better protection for your wines!